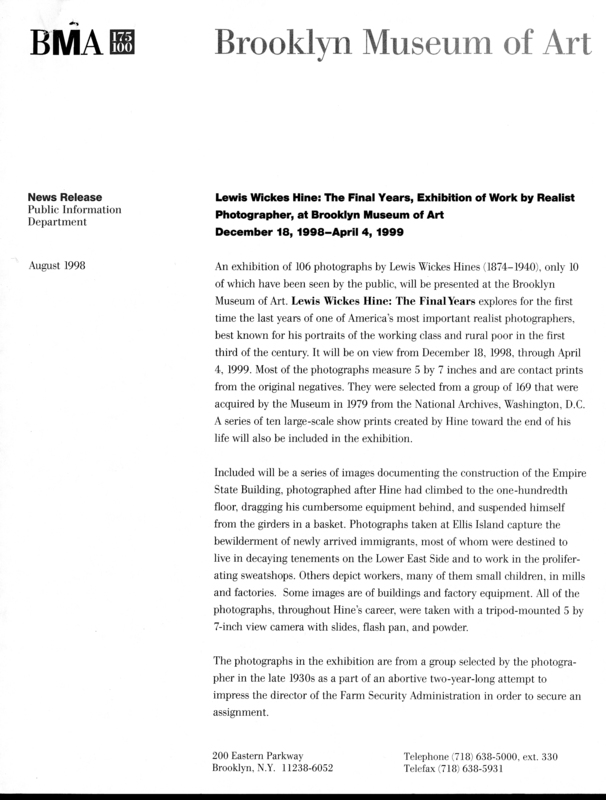 August 1, 1998 An exhibition of 106 photographs by Lewis Wickes Hines (1874-1940), only 10 of which have been seen by the public, will be presented at the Brooklyn Museum of Art. Lewis Wickes Hine: The Final Years explores for the first time the last years of one of America’s most important realist photographers, best known for his portraits of the working class and rural poor in the first third of the century. 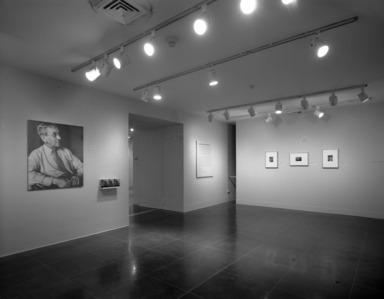 It will be on view from December 18, 1998, through April 4, 1999. Most of the photographs measure 5 by 7 inches and are contact prints from the original negatives. They were selected from a group of 169 that were acquired by the Museum in 1979 from the National Archives, Washington, D.C. A series of ten large-scale show prints created by Hine toward the end of his life will also be included in the exhibition. Included will be a series of images documenting the construction of the Empire State Building, photographed after Hine had climbed to the one-hundredth floor, dragging his cumbersome equipment behind, and suspended himself from the girders in a basket. Photographs taken at Ellis Island capture the bewilderment of newly arrived immigrants, most of whom were destined to live in decaying tenements on the Lower East Side and to work in the proliferating sweatshops. Others depict workers, many of them small children, in mills and factories. Some images are of buildings and factory equipment. 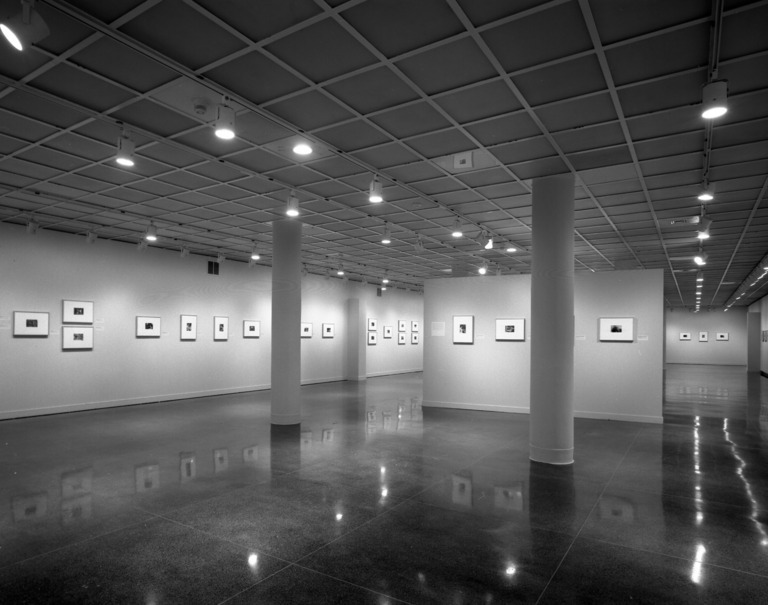 All of the photographs, throughout Hine’s career, were taken with a tripod-mounted 5 by 7-inch view camera with slides, flash pan, and powder. 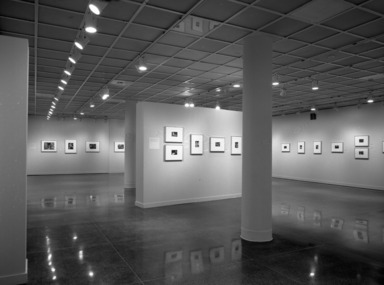 The photographs in the exhibition are from a group selected by the photographer in the late 1930s as a part of an abortive two-year-long attempt to impress the director of the Farm Security Administration in order to secure an assignment. Lewis Wickes Hine was born in Oshkosh, Wisconsin, in 1874. His father was killed in an accident shortly after Hine graduated from high school, and Hine then went to work in an upholstery factory, where he worked 79 hours a week for $4. In 1901 he came to New York, where he worked at the Ethical Culture School and took up photography. In 1905 he received a degree from the School of Education at New York University, and by 1907 he was attending graduate school in sociology at Columbia University. In 1906 he began a long and important relationship with The National Child Labor Committee, which hoped that photographs of child workers would awaken public interest and lead to regulatory legislation. Hine was to travel thousands of miles throughout the Northeast, the South, the Midwest, and as far west as Oklahoma documenting the working conditions of children from Connecticut’s tobacco fields to the cotton mills of Mississippi. He gathered data along with his pictures, wrote reports, gave lectures and slide talks, and often published essays about his investigations. For a time Hine also had commercial clients such as Western Electric and Sloan’s Liniment, while continuing his social photography. In his later work he was to shift from photographs that exposed abysmal working conditions to images that spoke to the pride and dignity of the working man. The latter was exemplified in Men at Work, a book for young adults that was selected in 1932 as the best book of the year by the Child Study Association. Toward the end of the photographer’s life, assignments dwindled. Lewis Wickes Hine, who had helped change the way that Americans viewed social conditions by documenting labor’s dehumanizing features and who had risked physical attack to expose the exploitation of child labor, was forced to go on welfare. He died in 1940, dispirited and destitute. 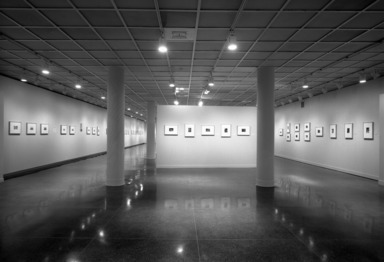 The exhibition has been organized by Barbara Head Millstein, curator of photography at the Brooklyn Museum of Art. Brooklyn Museum Archives. Records of the Department of Public Information. Press releases, 1995 - 2003. 07-12/1998, 190-191.